Socio-economic development is a process of quantitative and qualitative changes that increase phenomena in the economic, social and cultural areas. Various types of capital, including human and social capitals, support this development. These capitals are often described in literature. 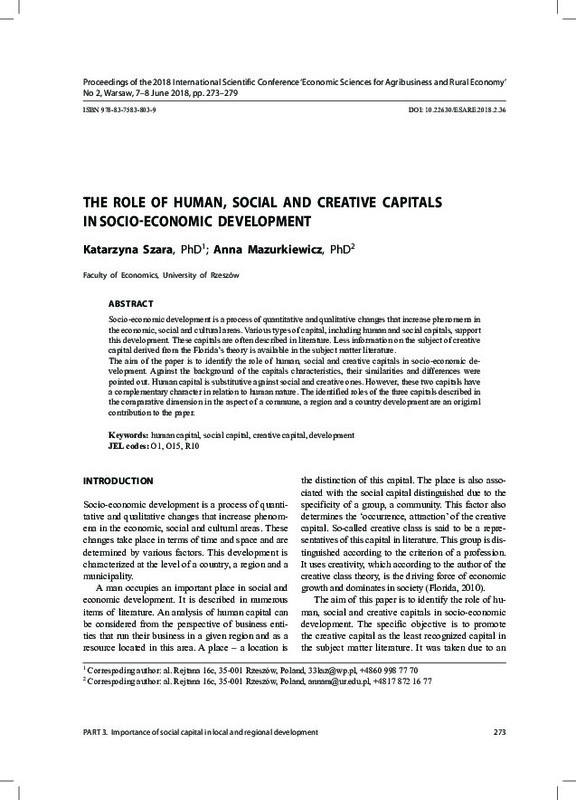 Less information on the subject of creative capital derived from the Florida’s theory is available in the subject matter literature. The aim of the paper is to identify the role of human, social and creative capitals in socio-economic development. Against the background of the capitals characteristics, their similarities and differences were pointed out. Human capital is substitutive against social and creative ones. However, these two capitals have a complementary character in relation to human nature. The identified roles of the three capitals described in the comparative dimension in the aspect of a commune, a region and a country development are an original contribution to the paper.